South Africa is to set up seven camps around the country for foreign migrant workers who have fled a recent wave of anti-immigrant violence. The seven new camps will take up to 70,000 people from the increasingly unsanitary conditions at temporary shelters put up around state buildings. The decision comes despite aid agency advice that South Africa lacks the expertise necessary to run the camps. Meanwhile, the UN said it is helping South Africa plan relief efforts. Medical charity Medecins Sans Frontiers (MSF) has warned that those sheltering in makeshift camps or outdoors have been left without protection - either physical or legal. "It's very cold at night, it's almost like one or two degrees. It's been raining in the last few days," said MSF South Africa programme director Muriel Cornelis. "And then legal protection - most of them do not have any status, no legal status, no temporary status." With the cabinet expected to announce its plans later on Wednesday, aid agencies fear the government has little experience of running what are likely to become semi-permanent refugee camps, says the BBC's Africa editor, Martin Plaut. Establishing such camps could come back to haunt the country for many years to come, our Africa editor adds. MSF said it was finding cases of diarrhoea and chest infections in overcrowded shelters near Johannesburg. The International Red Cross's Francoise Le Goff told the BBC it was vital the workers left these temporary shelters. "We have problems with sanitation; it's cold; people are getting sick, so their security is barely there," she said. "People need to leave this place and have an area where they can settle a little better and where they can reorganise a better life." The UN has been conducting a survey of conditions in existing, temporary camps in the Johannesburg, spokesman George Nsiah told the BBC's Network Africa programme. He said there was no danger of temporary camps becoming permanent, adding that the South African government was "doing everything possible that will enable those affected to return to their normal lives". South African President Thabo Mbeki has denounced the anti-immigrant violence as the worst act of inhumanity South Africa has seen since the end of apartheid. But the president has been criticised for his handling of the crisis, including a response which some have seen as slow. The officials "are the ground talking to people, to arrest the violence so it doesn't spread any further and ensure the relief is given to those who are affected," he said. Meanwhile, Nigeria says it will press for compensation from the South African government for its citizens who were victims of the violence. Nigerian Foreign Minister Ojo Maduekwe told AFP news agency that no Nigerian was killed in the attacks, but many have lost their properties and others have had their shops looted. The unrest, targeting migrants from Zimbabwe and other African countries, began near Johannesburg earlier this month. Fifty-six people have been killed and more than 650 injured in the attacks, according to officials. 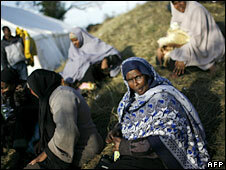 Aid agencies say the true number of displaced people is at least 80,000. 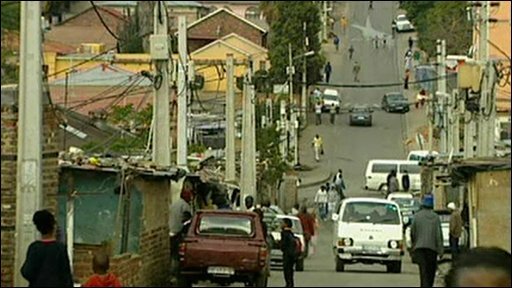 The troubles flared with a wave of attacks on foreigners in the township of Alexandra, within sight of some of Johannesburg's most expensive suburbs. They have since spread to seven of South Africa's nine provinces. 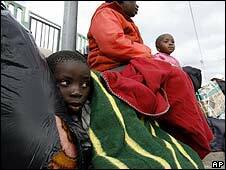 Many people have fled South Africa to countries including Zambia, Mozambique and Botswana. Resentment against foreigners who are seen to be harder working and better educated than locals have been cited a factors fuelling the violence.